Like it or not, unfortunately, saggy breasts is a problem that all women, sooner or later, encounter with. Fortunately, some things, like saggy breast still can be kept under control, or at least to slow it down. 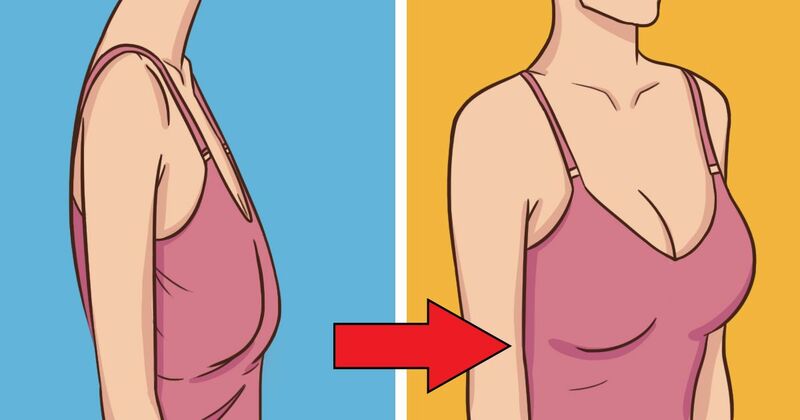 Having sagging breast in perfectly normal, especially if you are over 40 and as we age, entire skin, muscles, including breast are losing elasticity. They are many factors for sagging breast, of course, first is our age, but also, important role has genetic, breastfeeding for sure, rapid loss weight, pregnancy etc. Did you know that wearing bra that is not suitable to your breast size could lead to sagging breasts. There are also certain diseases, such as respiratory problems or lung disease, which can also be responsible for sagging breasts. Excessive intake of alcohol and cigarettes can contribute also. To have perky breasts and to delay saggy breasts which is natural, we offer home remedies and few tips which some of you will find them useful. Regular physical activity where breast exercises are included, such as push ups, chest press and chest pull ups, has positive effect on the breast. Few pounds more or less probably will not cause any problem, but effect of 20 lbs will certainly be a problem. When there is rapid weight loss or rapid gain weight, skin tissue and breast tissue is stretched like rubber and becomes looser. Blend pomegranate peel and mix it with warm mustard until you get homogen mixture. Use this mixture to massage your breasts. Massage them gently, in a circular motion for 5-6 minutes. Pomegranate is fruit high in phytonutrients, which is an anti-age component and mustard has similar properties, making this mixture ideal to maintain healthy and flexible skin. Use this treatment before bedtime. Olive Oil is well known for his efficiency and usage in many beauty treatments. Antioxidants and fatty acids in olive oil fight free radicals which cause breast sagging. Massaging this oil into the breast, reverse that natural process made by free radicals and for sure it delays it. Heat 2 Tbsp Olive Oil for better absorption, just to be little bit warm and massage your breast for 10 to 15 minutes per day, also this is stimulating the blood flow. Do this treatment every second day, like 3-4 times a week. Smoking kills, we all know that. Another thing in his negative effects is that promote breast sagging in women. Smoking like we know, affect our lungs and thus reduce the amount of oxygen we breathe which has also impact on the skin,leading it to lose elasticity and flexibility. Exposure to sun is important, because it feed our body with vitamin D when our skin is directly exposed to UVB, but from other side, among many negative effects on direct exposure to strong sun rays is that UV rays trigger stretch of collagen, which lead to wrinkles and loss of flexibility of the skin which is directly link with breast sagging. So, stay on the sun, but don’t forget your sunbathe protection. We hope you will find this tips and remedy against saggy breasts useful.